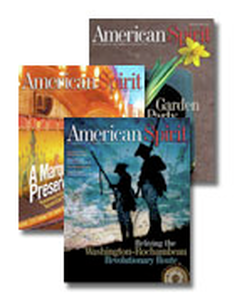 The award-winning American Spirit magazine is a handsomely illustrated, bimonthly publication focusing on the Society's objectives. Articles cover such subjects as American history, historic preservation, patriotism, genealogy, and education. Whatever your interests, you will find informative, entertaining, and engaging articles in each issue of DAR's American Spirit magazine.